This is rather a simple, modest, yet very flavourful, filling and soul-satisfying risotto dish that's quick and easy to make. From vegetables, fruit to meat, poultry, and seafood, the variations are endless, just like pasta. Get yourself a glass of Valpolicella Classico Superiore or Pinot Grigio if you prefer white, and enjoy! Heat two tablespoons of olive oil in a skillet on medium heat. Add in the diced onion and stir until tender. Add in risotto rice and minced garlic. Stir until rice becomes translucent. Pour in the white wine. Simmer until the wine is absorbed. Cut the salmon into inch-sized dices. Season with salt and pepper. Heat one tablespoon of oil in a skillet over medium heat. Add in diced salmon and cook until lightly golden. Season the risotto with salt and pepper. When the wine is all absorbed, add half of the hot stock and keep stirring, until that has been absorbed. Pour in the rest of stock, stirring frequently until the rice is cooked al dente. This will take 20 minutes or more. Add in chopped dill, green peas and creme fraiche. When the rice is cooked, gently stir the pan-fried diced salmon into the risotto, and cook for a further 1-2 minutes to heat through. Season, to taste, with salt and black pepper and serve. This is a very nutritious and delicious loaf with spelt, wholewheat, flaxseed and honey. It has become one of our favourite breakfast bread recipes and it's perfect for a lunch sandwich too. Flaxseeds contain high levels of dietary fiber, are high in omega-3 fatty acids, and may lower cholesterol level, stabilize blood-sugar levels and reduce the risk of heart attacks, provide antioxidants and may play a role in decreasing your risk of cancer. In a large bowl, combine the spelt flour, wholewheat flour, undissolved yeast, and salt. Heat the milk, water, honey, and butter until the mixture combined and warm. Make a well in the center, and gradually add the milk mixture and the egg to the flour mixture. Stir at slow speed for 2 minutes, then stir in flaxseeds until well-combined. Increase the speed and stir until soft dough forms. Turn the dough out onto the lightly floured surface and knead until the dough smooth and elastic, about 5 minutes. Shape the dough into a round and place in a large, lightly oiled bowl. Cover with a cling film and leave to rise in a warm place for 1 hour, or until it doubles in size. Roll out dough to a rectangle, about 12x8 inch/30x20 cm. Roll it up, starting from the short end, and pinch the seam to seal. Place, seam side down, in a standard loaf pan lined with baking paper. Cover; let rise in warm, draft-free place until doubled in size, about 1 hour. Bake at 180C/350F for 30 to 35 minutes until golden brown and cooked through. Brush the top with melted butter. Cool on the wire rack. 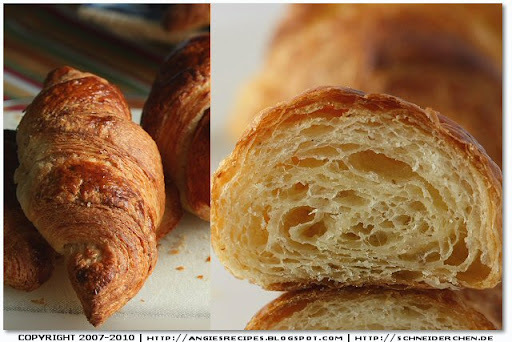 Who doesn't love buttery and flaky croissants? They are rich, decadent and irresistible! According to Jeffrey Hamelman, when you know it's a good croissant after you take a bite and look at your shirt: if it’s covered with flakes of golden pastry that shatter from each bite, then it's a good one. It took me two days to make 16 croissants, and my husband finished 4 at one go in 20 minutes. So I strongly suggest you double the recipe! Stir together warm milk, brown sugar, and fresh yeast in bowl of standing mixer and let stand until foamy, about 5 minutes. Add spelt flours, and salt and mix with dough hook at low speed until dough is smooth and soft, about 5 minutes. Transfer the dough to a work surface and knead by hand 2 minutes, adding more flour as necessary, a little at a time, to make a soft, slightly sticky dough. Wrap the dough with a cling film and chill for 1 hour. Place butter between two sheets of cling film and roll with a rolling pin to form 8x5 inch/20x12 cm rectangle. Chill until firm. 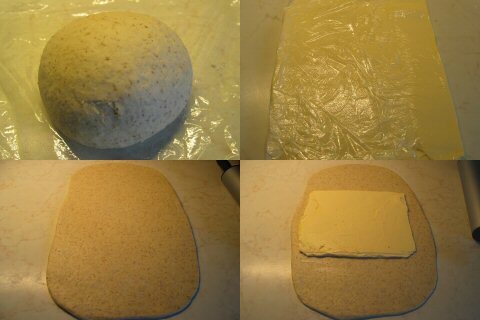 Remove the dough from the fridge and roll out on a lightly floured surface into a 16x10 inch/40x25 cm rectangle. Arrange dough with a short side nearest you. Put butter in center of dough so that long sides of butter are parallel to short sides of dough. Fold the bottom up over the butter, brushing off any excess flour, and then fold the top down over the butter to seal the butter. With a heavy rolling pin, roll the dough into a rectangle, approximately 15x10 inch/38x25 cm. Fold the length of dough into thirds, as for a letter. Turn so that the open ends are at twelve and six o'clock. The first simple “fold” is completed. Wrap well in plastic and chill overnight. Repeat the simple fold one more time. Wrap the dough tightly in plastic and chill 1 hour. Remove the dough from the refrigerator and place on the floured work surface. Unwrap and roll out to a rectangle, about 15x10 inch/38x25 cm. 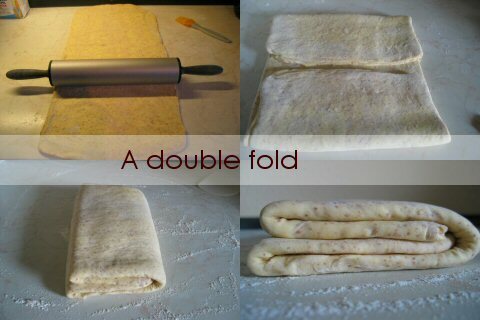 This time fold the top and bottom in so that they meet in the middle of the dough, then fold the dough in half again so that there are four layers of dough. Chill the dough, wrapped with plastic, in the fridge for 2 hours. Repeat the double fold once more. This is the final fold before rolled out and cut into croissants. To shape the croissants, roll the dough into a 25x15 inch/64x38 cm rectangle on a lightly floured work surface. It should be about 1/4 inch/6mm thick. From the long side, fold the dough into half and using a yardstick as a guide mark the folded strip into 8 triangles and the scrapings of dough at each end. Cut each double triangle into two. So you’ll have 16 triangles. Make a small slit in the base of each triangle, place a piece of dough trimming at the base. Starting at the base of the triangle, roll the dough up into a log. Tuck the tip the triangle under the body of the croissant. Bend in two corners to form the crescent shape. Place the croissants on a baking sheet and allow them to rise for 1 to 2 hours until almost doubled in size. Half an hour before finishing the proofing, brush the croissants with the lightly beaten egg. Preheat the oven to 200C/400F with a shallow dish filled with water at the bottom of oven. Bake the croissants for 20-25 minutes. Allow them to cool on a rack before serving. The distinct peppery tang and earthy flavour of arugula make this pesto especially rich, robust and utterly delicious! Besides using it for the pasta, I also used it to make one wholewheat pizza with lots of black olives, and tomatoes. Bring a large pot of water to a rapid boil. Add 1 teaspoon salt and the pasta to the boiling water and stir. Boil gently uncovered, stirring occasionally. Follow package directions and cook until al dente stage, chewy but not hard. Meanwhile, combine arugula, garlic slices, walnuts and Parmesan cheese in a food processor. With the machine running, slowly drizzle in olive oil and process until evenly blended. Season pesto well with salt and freshly ground black pepper. Mix until evenly combined. Drain pasta and return to the pot. Add arugula pesto and toss well. Serve immediately. The pesto will keep about 1 week in a tightly sealed container in the refrigerator. "Karlsbad Ring Cookies" are a Christmas speciality from Czech, that are often decorated in contrasting coloured candied fruits. Since my husband refuses to eat candied fruit, I had to use the sugar crystals and chopped almonds instead. They truly are melt-in-mouth delicious! The recipe is adapted from "Böhmisch Kochen Adelheid Beyreder". Cream the butter and powdered sugar until pale and fluffy. Add in sieved egg yolks, vanilla extract and a pinch of salt. Beat until well combined. Add in flour and work to a smooth cookie dough. Wrap the dough with cling film and chill for an hour. Preheat the oven to 190C/375F. Line two baking trays with parchment paper. Remove the dough from the fridge and roll out between two sheets of parchment paper to 3mm thick. 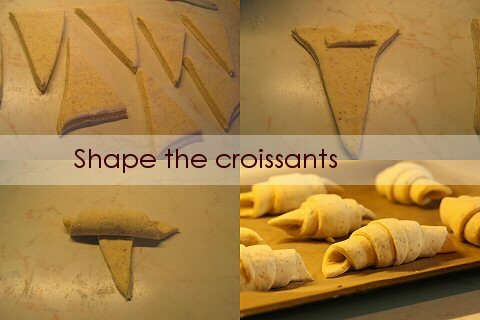 Use a 5cm-diameter waved shaped cookie cutter to cut out the cookies and place them on the prepared trays. Now cut out the rings with a 3cm-diameter circle-shaped cookie cutter. Reroll any scraps and repeat. Brush the rings with lightly beaten egg and sprinkle white sugar crystals or chopped almonds on top. Bake for about 15 minutes or until just beginning to brown around the edges. Cool cookies completely on a wire rack and store in an airtight container. This pear salad is really simple, and it is only as delightful and delicious as the ingredients you use. Juicy sliced pears, peppery arugula lettuce (or lamb's lettuce, actually almost all kinds of lettuce will work), sweet sharp red onion rings, and crunchy toasted walnuts, are all tossed with a creamy maple-yogurt dressing. I used Anjou pear, but again, any other types of pears, like Bartlett, or Nashi, would all work fine. Serve the salad with some homemade bread and a glass of young and crisp white, like Pinot Grigio. Whisk the ingredients for the dressing together until well combined. Season the dressing with salt and pepper. Store the dressing in the fridge until ready for use. Rinse and dry the rocket salad. Place them in a mixing bowl together with onion rings and sliced pears. Drizzle with the lemon juice and gently toss. Divide the salad into 4 platters, pour the prepared dressing over, then sprinkle with toasted walnuts. Garnish with pomegranate seeds, if desired. Bacon and cookies...the combination might sound odd to you, but they are so freaking good with salty, nutty, and crunchy texture. Highly addictive! Cook the bacon until crisp. Dry them in a paper towel and roughly chop. Line two baking trays with paper. Set aside. Cream the butter and sugar until light and fluffy. Beat in egg whites until combined. Add in the pastry flour, dried thyme, and chopped pistachio. Work the mixture until it comes together. Fold the cling film so that the dough is completely covered. Lightly roll it until you get a log, about 5 cm in diameter. Chill them at least 2 hours or overnight until thoroughly firm. Preheat the oven to 175C/350F. Line two baking trays with paper. Remove from the fridge, and slice the log into cookies, about 5 mm thick. Place the cookies on the prepared trays and bake 15 minutes. Cool the cookies on wire racks. Stir them in an airtight container for at least a week. A delightful combination of the caramelized onion and dill makes this sourdough boule extremely flavourful and delicious! Peel and dice the onions. Heat a tablespoon of olive oil in a skillet. Add in diced onions and cook until lightly browned. Set aside to cool. Whisk together whole spelt flour, all purpose flour, wheat bran and yeast in a mixing bowl. Add in warm water, rye sourdough, the remaining olive oil, salt and fresh dill. Stir at the slow speed until dough comes away from bowl but is still sticky. Turn the dough out onto a lightly floured work surface and knead until the dough is smooth, about 5 minutes. Shape dough into a ball and transfer to a lightly oiled bowl, cover with cling film, and let rise in a warm place for 30 minutes. Remove from the bowl, add in browned onions and knead again until incorporated. Return it to the bowl and let rise, covered, for 20 minutes. Fill an oven-proof bowl with boiling water and set it on bottom shelf of oven. Preheat the oven to 190C/375F. To shape a boule, invert a bowl of risen dough onto a lightly floured surface and pat to flatten it out slightly. Bring the edges up and to the center, forming a round. With both hands cupped over the dough, rotate the dough while further moothing and tightening the ball and seal the folds on the underside. Cut criss-cross slashes across the upper surface with a sharp blade. Lightly brush the top with water and sprinkle the sesame seeds over. Bake in the center of hot oven for about 45 minutes. Remove and cool the bread on a wire rack. These buttery shortbread cookies have a delicate green tea flavour and would be just wonderful for an afternoon break. Not a fan of green tea? Well, these cookies might change your mind and lighten up your day! Whisk together the flour, ground almond, matcha powder and salt in a mixing bowl. Beat the butter until soften, then add in sifted icing sugar and beat until light and pale. Add in flour mixture and stir with a spatula until combined. Divide the dough into two portions. Place a large sheet of cling film on the work surface and place one portion of dough onto cling film. Fold the cling film so that the dough is completely covered. Lightly roll it until you get a log, about 5 cm in diameter. 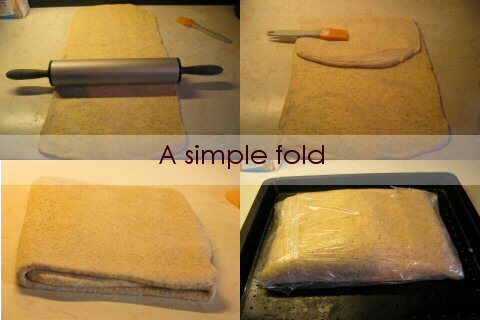 Wrap the other portion of dough with a cling flim too. Chill them at least 2 hours or overnight until thoroughly firm. Preheat the oven to 160C/320F. Line two baking trays with paper. Remove from the fridge, and slice the log into cookies, about 5 mm thick. Roll the other dough out to 5mm thickness and cut with cookie cutter. Place the cookies on the prepared trays and bake 15 minutes. Cool the cookies on wire racks. The red wine gives the pasta an unique deep purple colour and a sublime, earthy flavour complemented by a handful of rich, peppery arugula and sharp, nutty Parmigiano-Reggiano. Bring a pot of salted water to a boil. Cook the spaghetti, stirring occasionally, for 5 minutes. The pasta will finish cooking in the red wine. Drain the pasta and set aside. Add the pinotage and sugar to the pasta pot. Bring it to a boil over high heat and cook until reduced by half, about 5-8 minutes. Add in spaghetti and cook, stirring occasionally, until most of the red wine is absorbed and the spaghetti is al dente, about 3 minutes. Meanwhile, heat a large skillet over medium-high heat. Add in olive oil, reduce the heat to medium-low and stir in garlic until golden. Turn the heat off. Add in pasta, arugula, salt and pepper, toss gently and transfer to serving plates. Sprinkle with the cheese and serve. Thank you, Elisabeth at Food and Thrift Finds, and Joudie at Moodfood Blog, for sharing this one lovely blog award with me. And I also want to express my sincere appreciation to Gina at What's for Dinner across State Lines, and Alisha at The Ardent Epicure for thinking of me in the "Tag Game". These pumpkin bars are light in texture, wonderfully moist and delicious. A thick layer of delightfully spiced pumpkin filling in between a buttery crust and chopped pea-nutty topping. Drizzle some caramel over and enjoy them with a pot of freshly brewed tea. A perfect autumn treat! Preheat oven to 175C/350F and place the rack in the center of the oven. Line the bottom and sides of a 24x36 cm baking pan with aluminum foil that has been buttered and floured. Blend the ground peanuts, flour and salt together in a bowl. Cream the butter and sugar until light and fluffy, 2 to 3 minutes. Beat in the vanilla extract. Add the flour mixture and beat until a soft dough forms. Press the dough evenly and firmly onto the bottom of the foil-lined pan. Bake for about 15 minutes or until the shortbread is set and beginning to brown around the edges. Remove from oven and place on a wire rack. Whisk the eggs, pumpkin puree, vanilla extract, spices, and salt in a large bowl until combined. Gradually stir in the sour cream and milk. Pour the filling over the pre baked crust and sprinkle the chopped peanuts all over the top. Bake in the hot oven for about 35 minutes, or until the filling is set in the center. Remove from oven and place on a wire rack to cool. Lift the pumpkin bars from the pan by holding onto the edges of the aluminum foil. Cut into squares or bars.